The NHIndustries NH90 is a medium-weight multi-role utility two engine helicopter, developed in two main variants: TTH (Tactical Transport Helicopter) and NFH (NATO Frigate Helicopter). The NH90 accommodates 2 pilots (and possible a sensor operator on NFH) and 20 troops or 12 stretchers mith medics in its military role. The NH90 features a 4-bladed main rotor with blades made from composite materials and the hub from titanium and a 4-bladed tail rotor assembly. The helicopter is powered by 2 Rolls-Royce/Turbomeca RRTM322-01/9, or two General Electric/Fiat Avio T700/T6E1 turbo-shaft engines. The NH90-NFH variant is primarily designed for autonomous Anti-Submarine Warfare (ASW) and Anti Surface Warfare (ASuW) missions. The comprehensive mission equipment packages allow a wide range of additional missions to be performed including Search and Rescue (SAR), maritime patrol, vertical replenishment, troop transport, medical evacuation and amphibious support roles. The helicopter is designed for day and night operations in adverse weather conditions from the decks of ships. Due to its weight and dimensions, the deck-lock system, the deck traversing system and the automatic blade and tail folding system, it can operate from small frigates even in high sea states...The NH90-TTH's primary role is that of tactical transport ie moving troops and supplies around. It can also be configured for more specialist roles such as Combat Search and Rescue (CSAR). Up to 20 troops or 12 stretchers can be carried in the NH90-TTHs cabin. Small tactical vehicles such Supacat ATMPs can be carried, with access via a hydraulic rear ramp. Up to 2500kg of cargo can be carried onboard.. In the early 1980s a European multinational development program was initiated for a new multi-purpose transport and naval helicopter, intended to replace the Bell UH-1 Huey, Aerospatiale Puma, Westland Lynx, and Westland Sea King. In 1991, the project was known as the NH90 Europan Transport Helicopter. The program was formally initiated in August 1992, with the establishment of the NHIndustries (NHI) for the development and production of the NH90. Countries participating in the project were France, Germany, Italy and the Netherlands. Norway became a "risk-sharing partner" in 1994. Portugal joined the group on 21 June 2001. The NHIndustries consortium is headquartered in Aix-en-Provence in France. Four Partner Companies sharing the Development, Production and In Service Support of the NH90 Programme are: AgustaWestland (Italy) 32.00%, Eurocopter (France) 31.25% and Eurocopter Deutschland (Germany) 31.25% ( both belonging to EADS Group) and STORK Fokker Aerospace (The Netherlands) 5.50%. On 1 September 1992, NH Industries signed a NH90 design-and-development contract with NAHEMA (NATO Helicopter Management Agency). Design work on the NH90 started in 1993, with the first three prototypes built in Marignane in France. The first prototype: NH-90-TTH PT001 (F-ZWTH), flew first on 18 December 1995; the second prototype NH-90-NFH PT002 (F-ZWTI), flew first on 19 March 1997 and the third prototype, NH-90 TTH PT003 (F-ZWTJ) flew first on 27 November 1998. Prototype four NH-90 TTH PT004 was built in Gemany and flew first as 98+90 on 31 May 1999. Prototype five NH-90 NFH PT005 was built in Italy and flew first as MMX-613 on 22 December 1999. The Industrialization and first batch Production contract for 243 NH90 plus 55 options was signed on 30 June 2000 between NHIndustries and NAHEMA on behalf of the French, German, Dutch, and Italian Ministries of Defense (MoD). Today, a total of 529 firm orders have been placed by 18 armed forces in 13 countries, including Australia, Belgium, Finland, France, Germany, Greece, Italy, the Netherlands, New Zealand, Norway, Oman, Spain and Sweden. On 30 June 2000, Germany ordered 80 NH90 TTH helicopters and took options on 54 NH90 TTH helicopters. Qualification of the NH90 TTH was completed by NAHEMA on 31 March 2006. German type certification was granted on 1 December 2006, clearing the way for deliveries initially to the German customer, as well as for the respective national certifications of the NH90 TTH for other NAHEMA and export customers. On 13 December 2006, the first three NH90 Tactical Transport Helicopters (TTH), 78+01; 78+02 and 78+03 were official handed over to the German Army (Heeresflieger) at Eurocopter’s Donauwörth facility. 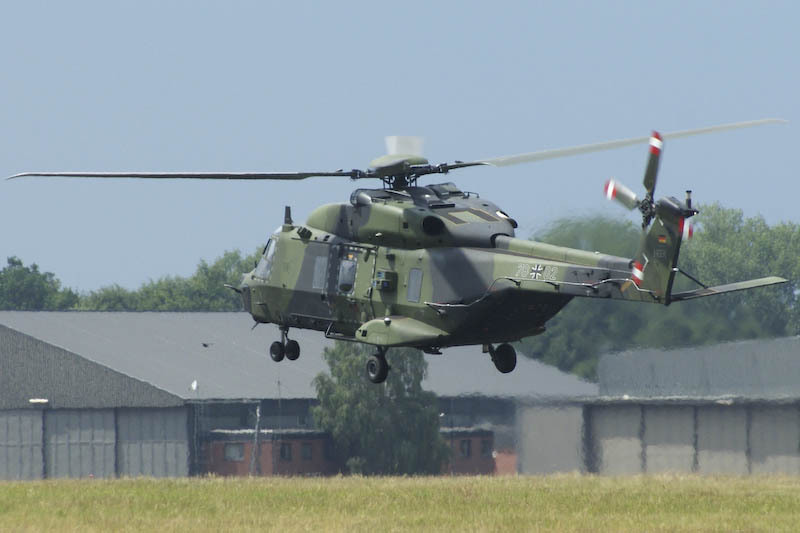 The German Army was the first customer to take delivery of the NH90. The aircraft with the Partner Companies Identification code TGEA002 was testflown as 98+92 in 2005. This NH90-TTH was re-serialed 78+02 in 2006 and entered service with the German Army Air Corps Weapons School (Heeresflieger-Waffenschule) in Bückeburg where it is in use for flight training since. The Partner Companies Identification code TGEA002 stands for: T - TakticalTransportHelikopter; GE-Germany; A - Army; 002 - Serial Number ( Eurocopter Deutschland).